I love Thrilled to Death because it's fast-paced and flows with ease. It's one of those novels you wish would take longer to read! I once belonged to a book club called "Sick Sh*t", in which all we traded and read were explicit, gory and disturbing crime procedurals. I'll admit that Thrilled to Death proudly falls into this category sans the super explicit details that could literally make you feel ill. Just the implications to the horrible crimes mentioned in this novel are enough to make you cringe and ponder the true sickness of psychopaths and weirdos out there. Thrilled to Death definitely caters to the true, hard-core mystery and crime fans. I have also read book two of the Detective Wade Jackson series called Secrets to Die For , which I reviewed here: Dreamworld Book Reviews - Secrets to Die For. As much as I enjoyed reading Secrets to Die For , it simply doesn't compare to how amazing and dark Thrilled to Death is. Once you start reading, you won't be able to put it down. 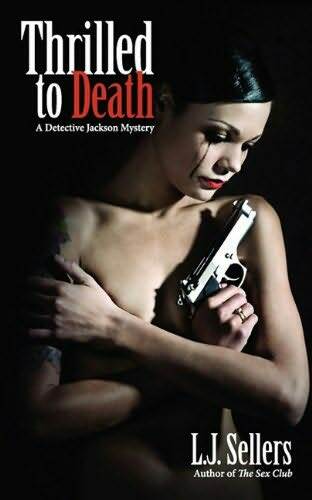 In my review of Secrets to Die For , I had mentioned how detached I felt toward the character of Detective Jackson; however my feelings on that have gone out the window. Detective Jackson is much more personable in Thrilled to Death and even experiences health issues we can all empathize with to an extent. Thrilled to Death also contains several red herrings. As a major mystery fan, I enjoy the challenge of figuring out the "hows" and "whys" behind all the components of the crime, and Thrilled to Death will definitely keep you on your toes! Whether these are intentional leads or loose ends for future novels remains to be seen, but I'm definitely putting the next Detective Wade Jackson on my must-read list. L.J. Sellers will be releasing Passions of the Dead in 2011, following with a stand-alone thriller entitled The Baby Thief. Giveaway now closed! The lucky winner is....NORMA!! Sounds like a good read–please enter me to win! Sounds intense :) Count me in please! The only problem with the give-away is that I'll be forced to buy more books when I win! LOL! I like J.D Robb and her Eve Dallas series of mysteries set in the future. The author makes it futuristic enough to be intriguing, but not so wild that it seems like sci fi.